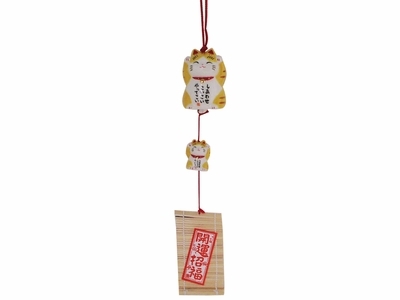 Made in Japan, this Japanese good luck cat charm wind chime is crafted from ceramic and bamboo and features a cute design of a striped Maneki Neko with both paws raised in a gesture of beckoning to usher good fortune your way. This adorable good luck cat charm wind chime features two lucky cats both with orange stripes and wearing an adorable smile and with both paws raised to bring more good fortune your way. Wearing the traditional lucky red collar with gold bell, both Maneki Nekos feature lucky Japanese wishes on their bellies. On an attached bamboo note on the base of this good luck cat charm wind chime is a note that says “Opening Fortune and Welcoming Good Luck”. Adorable with a pleasant chime, this Japanese good luck cat charm wind chime is a wonderful gift to wish friends and loved ones good luck for the coming year.